Ok, not about 'Red Programming' this time, but still might be an interesting read. As I write this, I'm reminded of a word in a recent forum. It was suggested that I was an atypical programmer. Atypical. Meaning: untypical, non-typical, uncommon, unconventional, unorthodox. It could also be suggested that 'Red' is an atypical programming language, it's certainly far better and clearly superior to pretty much all of the others. Ada Lovelace was an English mathematician and writer, chiefly known for her work on Charles Babbage's proposed mechanical general-purpose computer, the Analytical Engine. Born: 10 December 1815, London - Died: 27 November 1852, Marylebone. The Countess of Lovelace. Daughter of Lord Byron. The man who was: 'Mad, Bad and Dangerous to know' . A gifted mathematician, Ada Lovelace is considered to have written the first computer program in the mid-1800s. Ada’s story is a captivating tale. Not your typical role model: Ada Lovelace the 19th century programmer. Ahh, There's that word again, was she an atypical programmer. The daughter of famed poet Lord Byron, Augusta Ada Byron, Countess of Lovelace—better known as "Ada Lovelace"—was born in London on December 10, 1815. Ada showed her gift for mathematics at an early age. She translated an article on an invention by Charles Babbage, and added her own comments. But although Ada had the mind to see the potential of computers over a century before one was even built, she still doesn’t quite fit the mould of a traditional science heroine. Intelligent she might have been, but she was also manipulative and aggressive, a drug addict, a gambler and an adulteress. Alongside her character flaws, there are also some who still debate the validity of Ada’s accomplishments. Around the age of 17, Ada met Charles Babbage, a mathematician and inventor. The pair became friends, and the much older Babbage served as a mentor to Ada. Through Babbage, Ada began studying advanced mathematics with University of London professor Augustus de Morgan. Ada was fascinated by Babbage's ideas. Known as the father of the computer, he invented the difference engine, which was meant to perform mathematical calculations. Ada got a chance to look at the machine before it was scrapped, and was captivated by it. Babbage also created plans for another device known as the analytical engine, designed to handle more complex calculations. Ada was later asked to translate an article on Babbage's analytical engine that had been written by Italian engineer Luigi Federico Menabrea for a Swiss journal. She not only translated the original French text into English, but also added her own thoughts and ideas on the machine. Her notes ended up being three times longer than the original article. Her work was published in 1843, in an English science journal. Ada used only the initials "A.A.L." for Augusta Ada Lovelace, in the publication. In her notes, Ada described how codes could be created for the device to handle letters and symbols along with numbers. She also theorized a method for the engine to repeat a series of instructions, a process known as looping that computer programs use today. Ada also offered up other forward-thinking concepts in the article. For her work, Ada is often considered to be the first computer programmer. Ada's health suffered, however, after a bout of cholera in 1837. She had lingering problems with asthma and her digestive system. Doctors gave her painkillers, such as laudanum and opium, and her personality began to change. She reportedly experienced mood swings and hallucinations. Ada died on November 27, 1852. 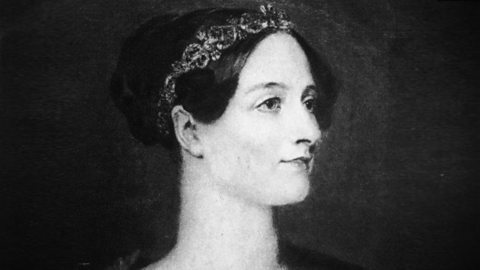 Ada Lovelace's contributions to the field of computer science were not discovered until the 1950s. Her notes were reintroduced to the world by B.V. Bowden, who republished them in Faster Than Thought: A Symposium on Digital Computing Machines in 1953. Since then, Ada has received many posthumous honors for her work. In 1980, the U.S. Department of Defense named a newly developed computer language "Ada" after Lovelace. The Ada language is used in Banking, air traffic control systems and also for controlling the United States defence department. Give me Ada Lovelace every day of the week. A woman who swore and smoked and said what she damn well thought. It’s a beautiful demonstration that whoever you are, whatever your character, there is a place for you in computer science. At that time It must have been so hard for her to achieve what she did. I promise lots more 'Red' in my next post. Some of it might even be atypical. I'm a slim 30 something with dark hair and brown eyes. Always happy to chat and make new friends.